Explore a phenomenal mosque in Casablanca • Weave through the twisting alleys of Fes' medina • Visit a carpet and embroidery workshop • Ride a camel across the desert • Stay in a hotel made of Saharan sand • Learn the secret to cooking perfect couscous • Get caught up in the energy of Marrakech. 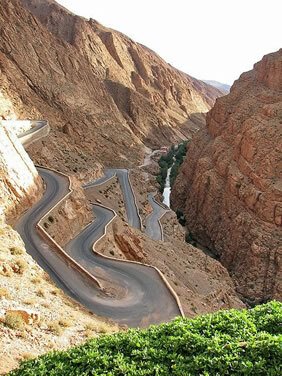 Travel from Casablanca to Marrakech through the moody desert landscape and past kasbahs and villages. Picnic in tranquil mountain gorges or investigate the labyrinth of souqs in the cities and haggle with traders. The colour and commotion of this enchanting land will dazzle travellers looking to experience a way of life suspended in time. Learn the secrets to the perfect couscous and discover ruins of a city built by a sultan looking to create his own version of Versailles. 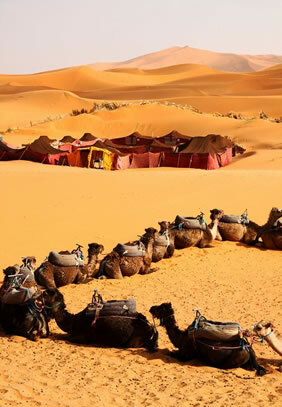 Stay in a hotel made of Saharan sand and haggle hard amid frenzy of the medina. The sights, sounds and smells of the cities and the aromatic flavours of the cuisine will infuse your memories of Morocco for years to come. We list the following optional activities for your information. This is not an exhaustive list and should be used as a guide only. In central Casablanca, this hotel offers an indoor swimming pool and an asio-mauresque spa centre with hammam. Its suites include free Wi-Fi and flat-screen TV, and some feature a private hot tub. The décor of each air-conditioned suite at Art Palace & Spa is inspired by a celebrity or international icon. Nespresso machines are provided and there is a DVD player, iPod docking station and mini bar. Some suites have a private terrace and therapeutic bath. Art Palace's restaurant serves international and local cuisine. Guests can enjoy a cocktail at Le 4 Lounge bar or relax at Le Living Room, for a tea and coffee with a variety of pastries. There is also a permanent art gallery, the Art Hall. For a more traditional experience, Le Riad Al Fen serves Moroccan cuisine, mint teas and regional delicacies. Located in Marrakech Medina, Riad Al Rimal offers a rooftop terrace with a hot tub, a pool in the central courtyard and a hammam. Jemaa El Fna Square is a 2-minute walk away. Decorated in a traditional Moroccan style, all rooms are air-conditioned and feature a view of the patio and a wardrobe. The en suite bathroom includes a hairdryer and free toiletries. A traditional breakfast is provided each morning at Riad Al Rimal. 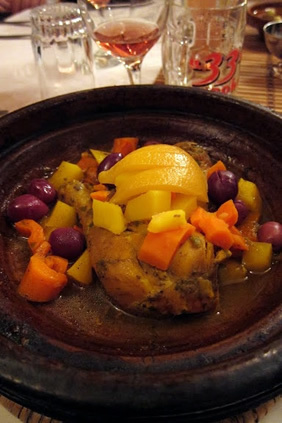 Guests can also sample Moroccan specialities in the dining room, upon request. You are required to carry your pack on and off trains and buses, up hotel steps, etc. Your itinerary may include easy paced walks or bike rides, but these are on mainly flat ground. 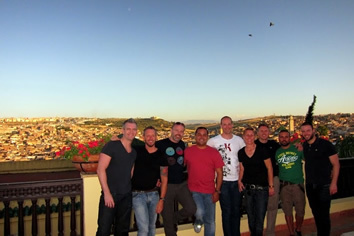 The trip includes a range of accommodation including hotels and boutique riads. Days of being on the move are well interspersed, communication with the outside world is ever-present and a wide variety of food is commonly available. Allow USD $750 for meals not included. Salaam Aleikum! Welcome to Morocco! You can arrive at any time on Day 1 as there are no activities planned until the important welcome meeting at 6:00pm. Following this meeting, we'll head for an optional dinner at the famous Rick's Cafe. Our journey begins in the bustling Port city of Casablanca. Modelled after Marseille in France, Casablanca has since become much busier than its parent and is now the undisputed economic capital of the country, with one of Africa's largest ports. 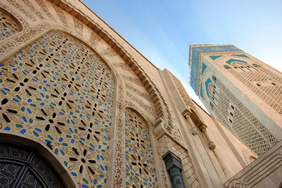 The architectural style of the city is curious; famous for its Art Deco French colonial buildings and Mauresque governmental institutions, an old Medina and of course the phenomenal modern day masterpiece - Hassan II Mosque, of which a guided tour is included on Day 2. A pleasant way to spend the day exploring Casablanca is to wander around the old medina and the old city walls, then jump in a taxi to visit the Quartiers des Habous - the new Medina which is full of shaded squares, and narrow streets lined with arcades that lead from one souk to another. This is a great place to enjoy a Moroccan coffee and maybe start improving your bargaining skills in the souks or the interesting local food markets that stretch behind the quarter. Finish the day with a walk along the Corniche watching the locals enjoy sunset football on the beach. After breakfast we have a guided tour of the Hassan II mosque. Perched oceanside at Islam's western extremity, it was completed in 1993 after years of work by around 30,000 craftsmen. The mosque was the late King Hassan II's most ambitious project and was funded by public subscription - all $800 million of it! Only the mosques at Mecca and Medina are bigger, and its 200m-high minaret is the tallest in the world. 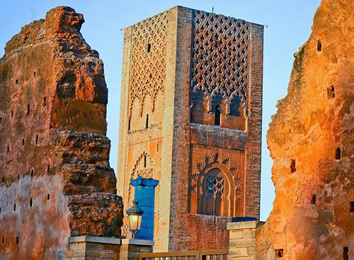 In the afternoon, we head by private minibus to Meknes, with a stop in Rabat along the way for a guided tour. 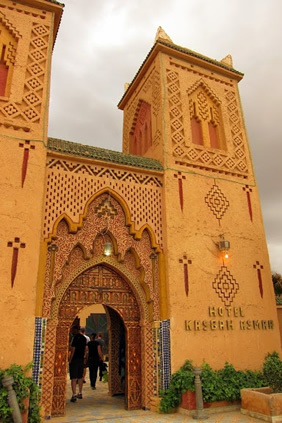 We'll visit Kasbah Chellah, Kasbah Oudaias and the Archaeological Museum before checking in to our cozy riad where we'll enjoy an included dinner. Rabat has a long and rich history, and plenty of monuments to show for it from the Phoenician, Roman, Almohad and Merenid times. The power shifted at times between Rabat and Salé, the whitewashed town across the Bou Regreg river, where time appears to have stood still. The quiet medina has an authentic feel to it, some good shops and fascinating architecture. You'll be blissfully ignored on the streets and souqs, so it's easy to discover the city's monuments and hidden corners at your own pace. The picturesque kasbah, with its narrow alleys, art galleries and magnificent ocean views, is also worth exploring. Today we have a guided tour of Meknes before continuing on to Fes, where given the opportunity, watching the sun set over the huge Medina whilst a dozen prayer calls vie for attention is an experience you are likely to remember forever. Tonight we'll have an excellent dinner at a local restaurant. On the morning of Day 4 we take a guided walk of Fes to explore the treasures of the Medina, a living monument to an ancient past and still very much alive with the many craftsmen, markets, tanneries, ceramics, Medersa's and Mosques. We will visit the famous tannery known for the iconic view overlooking the dye pits. Our tour will also include a visit to a ceramic factory where we can see potters producing their crafts the traditional way. Descending into the labyrinthine alleyways of the Medina is like taking a giant step back to the Middle Ages. Preserved by the French for its historical value, this preservation also led to the decline of the city's importance, as both government and financial centres were set up elsewhere in the country. With the Jewish population moving away in 1956, and too many rural poor moving in for it to handle, this ancient centre of learning is only a shell of what it used to be. Still, it remains a fascinating living museum where getting lost is half the fun! 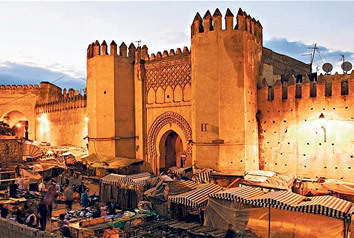 Fes is the most complete medieval city in the Arab world. The most ancient of Morocco's Imperial cities, it exists suspended in time. Occupants of the city are called 'Fassis', and they fancy themselves as the most sophisticated and intellectual of all Moroccans, having their own food staples and style of dress to prove it. 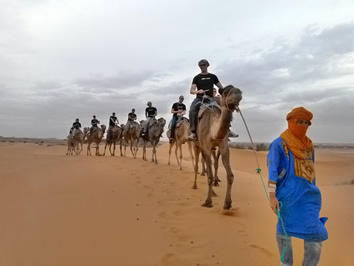 Day 5 sees us heading towards the Sahara Desert on a long journey. Our route takes us through cedar forests, home to the Barbary Apes, and into the valley between the Middle and High Atlas mountain ranges. We have many opportunities to stop and admire the panoramic views of the Kasbahs and palmeries (valleys lush with date palms, fields and orchards) en-route. We can pause in some of the frontier towns such as Erfoud and Rissani until we reach the end of the road and the small settlement of Merzouga. 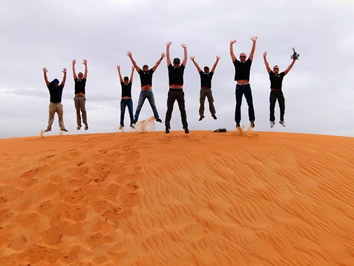 Our visit is to the Erg Chebbi dunes, which are the most stunning in the country and an experience essential to complete any visit to Morocco. 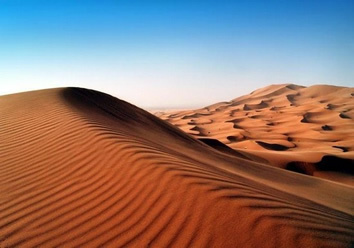 An Erg is a vast sea of shifting wind-swept sand that is formed into picturesque undulating crests and valleys, and the Erg Chebbi are one of the worlds classic landscapes of towering dunes, up to heights of over 150 meters. Tonight we stay in a hotel located on the most well-known oasis in the region, fit with a pool, restaurant, and stunning views of the dunes. On day 6, you are welcome to sleep in, or enjoy the pool, as there are no activities planned prior to our desert camp excursion. Late in the afternoon, we'll hop on our four-legged transportation for a sunset desert camel ride, en route to our home for the evening. Surrounded by giant waves of windswept sand, your tiny desert camp will be an experience like no other - a bit of comfort, and a lot of adventure including a traditional Berber dinner. Tonight we'll only have the option for twin-shared accommodations, and washrooms are shared, but trust us, it's worth the inconvenience! For the early risers the morning begins with a sunrise over the majestic dunes, before heading back to the hotel for breakfast, and another classic drive with dramatic changes of landscape to Todra Gorge - a spectacular canyon with sheer rock walls up to 300m high (approx. 4 hours). This will be our lunch stop. Enroute we will stop in a small town called Tinejdad (approx. 2 hours from the desert) and visit an interesting museum called Museum El Khorbat, which has a great collection of rural and historical Berber artifacts, clothing, jewelry and tools. 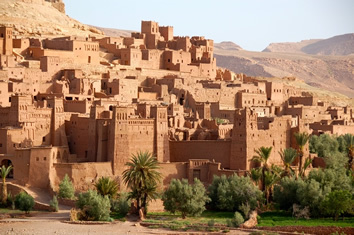 It is housed in three restored homes of a Ksar and provides a wealth of information about Berber living in the area. We then make the short drive to the equally spectacular Dades Gorge (approx. 2 hours). This valley is flanked on both sides by high limestone cliffs and bizarre rock formations with picturesque Kasbah's dotted along the course of the stunning valley of crops and palms. 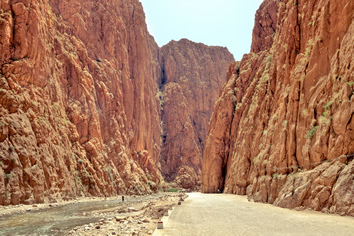 We say goodbye to the Gorge region and make our way further south towards the Kasbah country of Ait Benhaddou (approx. 3hrs). This scenic drive offers a glimpse of times gone by via the ruins of ancient Kasbahs; once colonial military desert outposts, austere mountains, wide open spaces, valleys of palm trees and irrigated fields. En-route we can possibly pause for lunch in Ouarzazate, the film capital of Morocco, where films such as 'Lawrence of Arabia', 'The Sheltering Sky' and 'Black Hawk Down' have been filmed. Time permitting we can take a tour of the Atlas Movie Studios. After lunch we drive on (approx. 45mins) to our final destination, the grand Kasbah of Ait Benhaddou - one of the most beautiful in all of Morocco and a UNESCO World Heritage site. This fortified village is a fine example of clay architecture and is also famous for its role on the silver screen, featuring in numerous films such as: Lawrence of Arabia (1962), The Jewel of the Nile (1985), Jesus of Nazareth (1977), The Last Temptation of Christ (1988), Kundun (1997), The Mummy (1999), Gladiator (2000), Alexander (2004). Centuries ago, Ait Benhaddou, on the Mellah River, was an important stop for the caravans passing through as they carried salt across the Sahara, returning with gold, ivory and slaves. Today, it is inhabited only by a handful of families and we can explore the maze of its streets at our leisure, or soak up the atmosphere from our hotel terrace while watching the sun set over this magnificent site. 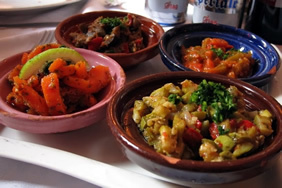 This evening, we join in on a simple cooking demonstration of Moroccos most famous cuisine: Cous Cous and Tajine. The ladies of the kitchen will prepare some fabulous traditional meals and we will eat well tonight. We travel to the majestic city of Marrakech (approx. 3hrs), Morocco's most alluring city. After settling in to our hotel we head to one of the most famous cooking classes in Morocco where we'll learn basic cooking skills, then feast on our creations. On Day 10 we will take a morning guided tour of the Medina and its mosaic of souq's, each devoted to a separate trade: pottery, woodwork, copper, leather, carpets and spices - a wander among them is a sensory delight. The afternoon is free to seek out some of the the numerous monuments of Marrakech, such as the well-known Koutoubia Mosque and its superb minaret - famous throughout the Islamic world and the 'sister' to the Giralda in far-away Seville, to the lesser-known tropical gardens of the French Painter Jacques Majorelle (now owned by Yves Saint Laurent). There is the Palais Bahia, a superb example of Muslim architecture, and the ruins of the Palais Badi, reputedly one of the most beautiful palaces in the world in its time. 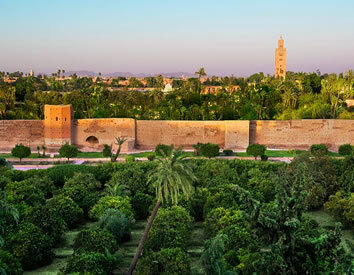 The Saadian tombs are a recently uncovered gem of the Medina. This evening we enjoy our optional farewell dinner at one of our favourite upscale restaurants in Marrakech, followed by an opportunity to join the thronging crowds of Djemaa el Fna. We'll wander around the singers, drummers, dancers, snake charmers, fortune tellers, tooth pullers, storytellers, jugglers and even old medicine men, before retiring to our riad for the evening. Day 11 - Departure day and we say 'Ma'Salama Shukran Bizzaf' for memories that will last a lifetime. There are no activities planned for today and you are able to depart the hotel at any time. You are required to carry your bags on and off trains and buses, up hotel steps, etc. Your itinerary may include easy paced walks or other physical activity, but these are on mainly flat ground. This trip travels to a relatively conservative area. We encourage you to experience the destination and culture with this in mind. 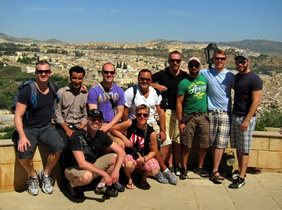 There will be no gay-specific activities, events, meals or day tours on this itinerary due to the cultural sensitivity of this region. We will do our best to provide a safe, comfortable environment for you and your fellow travellers. There are some long travel days in areas away from main tourist routes. High passes, windy roads and rough surfaces make for some challenging travel experiences. If you experience travel sickness we recommend you consider medication to help ease the discomfort. The receipt of commissions or kickbacks in exchange for recommending particular shops, services or activities is ingrained in the culture of the Moroccan tourism industry. In an effort to best control and monitor shopping and activities with an aim for the best experience possible, OUT Adventures has established a system of carefully selected shopping experiences and activities based on positive feedbacks from our previous travellers. On occasion these will be as part of included walking tours or outside of included activities in free time. Please note that if you feel that you do not wish to join in on these shopping experiences we assure you there is no obligation, and if you indicate your desire to not partake your group leader will help to facilitate a suitable alternative during this time. If you are happy with the services provided, a tip is appropriate, although not compulsory. While it may not be customary to you, it is of great significance to the people who will take care of you during your travels, inspires excellent service, and is an entrenched feature of the tourism industry across many OUT Adventures destinations. Restaurants: Local markets and basic restaurants - leave the loose change. More up-scale restaurants we suggest 5% to 10% of your bill. Local Guides: Throughout your trip you may at times have a local guide in addition to your leader. We suggest 10-20MAD ($1.50-3.00 USD) per person per day for local guides. Drivers: You may have a range of private drivers on your trip. Some may be with you for a short journey while others may be with you for several days. We would suggest a higher tip for those more involved with the group however 10MAD ($1-2 USD) per person per day is generally appropriate. Your Group Leader:You may also consider tipping your leader for outstanding service throughout your trip. The amount is entirely a personal preference, however as a guideline US $5-10 per person, per day can be used. Of course you are free to tip more or less as you see fit, depending on your perception of service quality and the length of your trip. Remember, a tip is not compulsory and should only be given when you receive excellent service. This is a country which may be very different from anything you have experienced before. Heat, pollution, poverty and the crowds can result in initial culture shock but should be seen as an exciting new challenge. During our time here we have come to love this wonderfully different country, but we know that we should always expect to encounter some difficulties along the way. In Morocco there are very different attitudes to time keeping, public cleanliness, privacy and service. If you are able to travel with a lot of patience and a sense of humour, then we know that you - like all of us - will be captivated by Morocco. Please note that as a desert country, Morocco can have extreme weather! Summer (approx. late June to September) can be very hot everywhere we travel. For those of you that are flying out of Casablanca: Trains from Marrakech to Casablanca, depart on the hour every 2 hours between 5:00am and 9:00pm and cost EUR8 for 2nd class and EUR12 for 1st class. The trip is scheduled to take 3 hours & 10 minutes and is subject to frequent delays. From Casablanca Voyageurs Station, trains run to the Casablanca airport every hour at 5 mins past the hour. First departure is at 5:00am and the last departure at 10:00pm. The trip takes 35 minutes. Check the useful website (in French) for more information - www.oncf.ma. Alternatively, from Casablanca city the 25km taxi ride to the Casablanca airport costs MAD250 (EUR25). Morocco is often misjudged as being an inexpensive destination. With tourism booming, the influx of cheap flights from Europe, prices for some items are becoming more equivalent to prices you would be used to at home. Eating in local restaurants, road side stalls and from markets can be inexpensive, but for nights out at tourist friendly restaurants you can expect to pay much more. With drinks, tipping and of course - shopping, it can all add up. Budgets are a personal choice but please bare in mind that you should not expect Morocco to be a budget destination. In Morocco some services and products are not a fixed price which means that your bartering skills will be tested from hiring taxis to buying a souvenir in the Medina. This can be challenging for travellers who have not experienced this before. Ask your leaders for advice when you arrive however the best approach is to smile and have fun as this is an entrenched part of Moroccan culture. All OUT Adventures Comfort trips are enjoyed with a maximum of 16 guests. The style of accommodation described in the day to day itinerary is a guideline. On rare occasions alternative arrangements may need to be arranged due to availability of rooms in our usual accommodation. A similar standard of accommodation will be used in these instances. Throughout the trip we request that our hotels prepare rooms in time for our arrival, however this is not always possible and we will not be able to check-in immediately on arrival at some hotels. Instead we can store our luggage and explore our new destination. Additional accommodation: If you have purchased pre or post trip accommodation (if available), you may be required to change rooms from your trip accommodation for these extra nights. Breakfasts in Morocco: Breakfasts are generally simple affairs consisting of bread, butter, jam, coffee/tea and juice (or similar). This is typical of breakfasts in Morocco hotels and large American/English style breakfasts are generally not available. While travelling with us you will experience the vast array of wonderful food available in the world. Your group leader will be able to suggest favourite restaurants during your trip. Generally our groups tend to eat together to enable you to taste a larger variety of dishes and enjoy each other's company. There is no obligation to do this though. Allow $500 USD for meals not included. You are met on arrival at Casablanca airport and transferred to the hotel. Please advise flight arrival details at least 14 days prior to departure if you wish to have this transfer provided. You will be met by a representative in the arrivals hall once you clear immigration. Look for the OUT Adventures Logo and your name. Please make sure you have access to an additional USD 400, to be used when unforeseen incidents or circumstances outside of our control (eg. a natural disaster or civil unrest) necessitate a change to our planned route. Please note that visas are the responsibility of the individual traveler. The visa requirements for your trip vary depending on where you are from and where you are going. Please refer to your OUT Adventures Invoice/Receipt for further information. Some of our hotels offer a laundry service. In addition, laundry services can be found in most major towns, but self-service laundries are very rare. Ask your leader who can direct you to the best places to do your laundry - usually at any 2 night stop to allow enough time for drying. Generally speaking you should pack as lightly as possible. On this trip you are expected to carry your own luggage and although you will not be required to walk long distances with your luggage (max 10-15 minutes) we recommend keeping the weight under 30lb. For this trip we recommend your bag, whether with or without wheels has carrying straps as we will be walking in areas with cobble stone or unpaved roads. Local Dress: Morocco can be considered a liberal Muslim country as many Moroccan women do not wear headscarves. Comparatively Morocco is very conservative by standards you may be accustomed to at home and you should dress accordingly. As a general guideline, shoulders and knees should be covered at all times. Otherwise you may be restricted entry into buildings of a religious nature and family homes and is considered disrespectful to the local culture. Money Exchange: The most convenient and cheapest way to acquire money is by ATM. Check with your bank for information on international fees and to ensure that your card will work. There are now ATMs (which accept both Visa and MasterCard) throughout all Moroccan cities. There are few problems changing money. There are many banks, all operating with equal exchange rates, and without commission. Cash in EUR, GBP and USD dollars are favoured for exchange. Please note that Australian Dollars (AUD) are not accepted in Morocco. The currency of Morocco is Dirham (MAD). Moroccan dirhams cannot be purchased outside of Morocco, but it is easy to get cash on arrival. Keeping In Touch: If you need to be contacted while travelling we recommend email. Wifi is generally available throughout the regions we visit, although it is possible you may be without email contact for several days on some itineraries. If someone wishes to contact you in an emergency while you are on one of our trips we recommend that they contact your local booking agent, or refer to our emergency contact details. We don't recommend that family and friends try to contact you through hotels, as they are subject to change and the reception staff may not speak English. Based on the entry requirements for countries visited on this trip, there are no vaccinations needed for entry. However, for more detailed information and to determine if you should take preventative measures to reduce the risk of illness, we recommend you consult your doctor or a travel medical clinic. OUT Adventures cannot provide vaccination recommendations. Fire precautions: Please be aware that local laws governing tourism facilities in Morocco differ from those in your home country and not all the accommodation which we use has a fire exit, fire extinguishers or smoke alarms. Seat belts: Please be aware that local laws governing transportation safety may differ from those in the western world or from your home country and not all the transport which we use provides seat belts. Petty theft and personal safety: While travelling in Morocco there is the risk of pick-pocketing and petty theft, particularly in the more touristy cities. We recommend that you exercise caution when walking alone at night and encourage you to walk together and only on main, well lit thoroughfares. Be particularly vigilant on public transport. Simple measures like carrying your daypack on your front, not hanging your bag over the back of your chair and wearing a money belt will reduce the chance that your valuables should go missing. Common scams in Morocco: When walking through touristy areas of cities you may be approached by 'helpful' locals who want to show you where to go or take you to a local spice shop. They will either ask to be your local guide for the day or expect money when you arrive at your destination. Please note these people are not registered guides and will try and get as much money from you as they can. A friendly 'no thank you (or 'la Shukran') should suffice. Traffic and driving on opposite sides of the road: Depending on where you come from please note that drivers in this part of the world may drive on the opposite side of the road from what you are used to. Look both ways before crossing any road. Traffic can be a little more chaotic than you might be used to at home with narrower roads and more motorbikes. Be aware! Moroccan tagines: Moroccan ceramic tagines bought in the souks or other shops in Morocco may contain high levels of lead. We strongly recommend you have any tagine you buy in Morocco tested before cooking with it or buy for decorative purposes only. At OUT Adventures, we believe in having fun and exploring new and developing cultures while being responsible travellers. On our trips, generally there are only two rules: No drugs and no prostitution. These two activities will result in putting oneself and the group at risk, and will result in removal from the trip by our group leader.